Emma Heath recently travelled to Kenya to experience the Maasai Mara ride for herself, and she could never have imagined the world she discovered there! 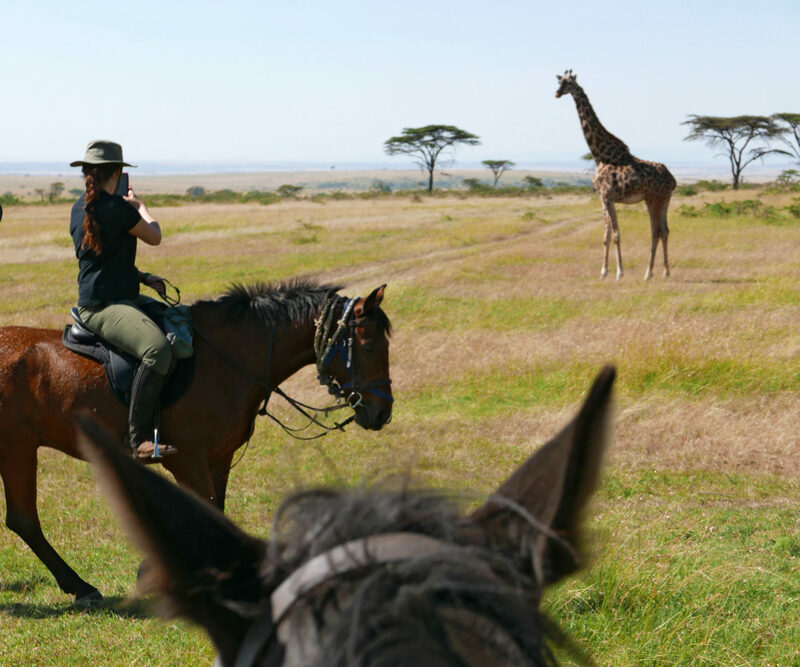 This truly is the ultimate horse riding safari, and in our opinion (and Emma’s!) the best possible way to experience the Maasai Mara. Read on to hear about Emma’s horse riding holiday in her own words. Were you happy with the Globetrotting ride that was recommended to you or chosen by you? OMG IT WAS THE BEST THING I HAVE EVER DONE. Was the information that Globetrotting gave you prior to your ride helpful? Yes. Just wanted to say thanks… you guys provided THE best support and advice, and made the entire trip so simple and enjoyable. I followed your packing list to the letter and it was perfect. So many useful bits of advice in those emails, and I felt completely relaxed, prepared and comfortable. Seriously….GREAT work, I have never had a travel experience that I felt was so well managed. You guys ROCK. Is there such a thing as a ten-star camping experience? Apparently so! I was hoping for comfort but I was blown away by the mini ‘tent city’ that appeared magically at every campsite, with every detail thought of and all the essentials (plus so many nice extras) provided. The mess tent was amazing, I didn’t expect to sit at a long table with china, silverware and flowers on the table every night… not to mention the food itself, which was amazing!! And I am pretty fussy! I slept like a log every night, and just felt spoiled rotten the entire time. I am ruined for normal camping for life… in fact, this ‘camping’ experience knocked the socks off most hotels I’ve stayed at! Tomohawk was a little CHAMPION. Super forward-moving, super fun, super chilled. He literally didn’t put a foot wrong. I think everyone in our group was well suited to their horses and very happy, but I can’t help thinking I got the pick of the bunch. These horses are seriously well-produced and many event or play polo as well as being safari horses… I was envious of how versatile they are! Can’t imaging my eventer at home coping with a herd of elephants!! Impossible to pick a highlight. Was it the day we cantered with a tower of magical, slow-mo loping giraffes? Running with the zebra and wildebeest? Staying on the banks of a hippo-filled river? Was it the moment we saw a stunning lioness teaching her cubs to hunt, or the time we saw another lioness kill a gazelle right in front of us? The landscapes, the animals, the horses, the camp, the guides… every part of the trip was better than I could have imagined in my wildest dreams. Words just don’t cover it. They were legends. Simon and Megan may be young, but they have an incredible amount of experience, knowledge and professionalism. They make everything feel natural, fun and casual, while at the same time ensuring things run like clockwork and every guest feels 100% comfortable. As well as being exceptional horse and wildlife people, they’re great people-people. It would not be an easy job and they do it so so well. Words just don’t do the Maasai Mara trip justice. AT ALL! 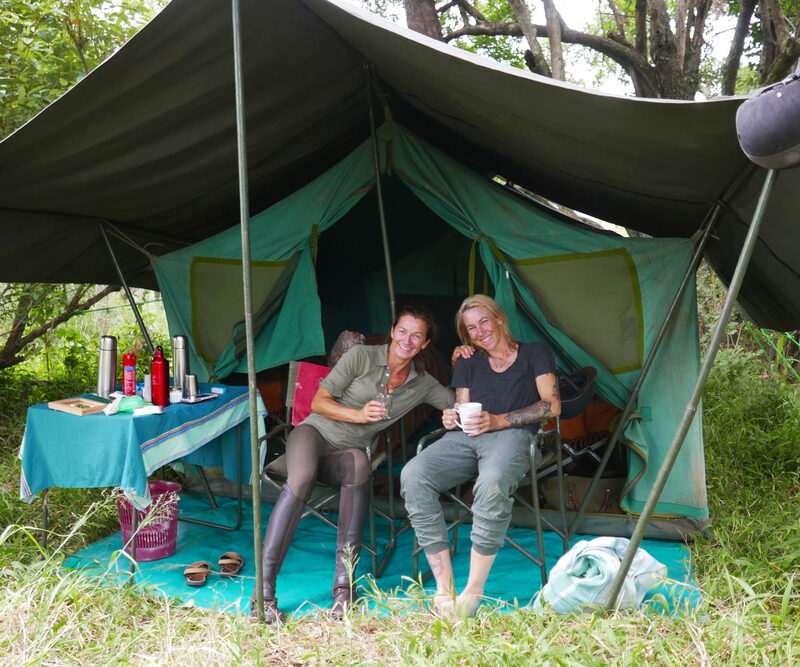 It felt like being in another world for seven days, where we were treated to this wild, incredibly immersive experience – but at the same time, spoiled rotten with all the creature comforts you can imagine. The horses are bred and produced beautifully, and so much fun to ride. The guides manage to be fun and easy-going, yet incredibly professional – their skill is out of this world, with nature, horses and people alike. The animals… where do I even begin?? We were surrounded by lions, cheetahs, elephants, giraffes, zebras and so much more – to say that the Mara is ‘teeming’ with wildlife would be an understatement. I was also lucky to find myself in the most friendly, lively group of people and had more fun than I have had in my life. It feels like a cliche, but I am still pinching myself that this trip actually happened. Find out more about our horse riding holiday in the Maasai Mara, Kenya, and secure your saddle seat on an upcoming departure here.